An artist's rendering of what the proposed Colossus alien-seeking telescope would look like. We might find aliens through the heat their civilizations give off, astronomers say, but it will take a megatelescope to do the job. Such a telescope, in fact, is planned. The telescope — called Colossus — would be a massive 250-foot (77 meters) telescope, which is more than double the aperture of any telescope yet constructed. 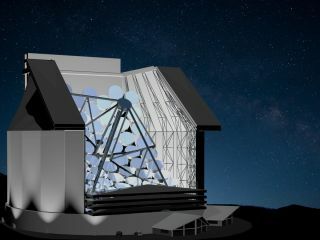 "If we had an investor come and say 'look, here are the resources you need,' we could have the telescope built within five years," said Jeff Kuhn, an astronomer at the University of Hawaii's Institute for Astronomy, who is on the proposal team. In searches for extraterrestrial intelligence, astronomers generally focus on seeking out beamed signals from other civilizations. In four decades of searching, nothing definitive has been found. There were, however, a few interesting moments, such as the so-called "Wow!" signal heard in 1977 that was never repeated. There are limitations with that method, however. Perhaps the aliens might not send out signals themselves. Perhaps they broadcast in channels we wouldn't think of using. Moreover, humans should perhaps be cautious about sending out signals and alerting more advanced civilizations to their presence, as Stephen Hawking has said. This is where Colossus can shine, Kuhn said. The telescope is a passive receiver that allows astronomers to seek out extraterrestrials without alerting them to the search. Kuhn's team builds on a concept first proposed by physicist Freeman Dyson in the 1960s. Humans can capture only a fraction of the energy sent out by the sun, but a more advanced civilization would want to grab as much as possible. Dyson suggested an extraterrestrial civilization would surround their star with a structure — now known as a "Dyson sphere" — that would capture the energy needed and then bleed the rest off into space. From Earth, a star that is faint optically but very strong in the infrared could be an indication of such a sphere, Dyson mused. Kuhn's team, rather than focusing on stars, is instead looking at the surfaces of alien planets. "Similarly, an exoplanet that was optically dark, but thermally bright, would be evidence of extraterrestrial civilization," Kuhn said. To date, there are few images obtained of exoplanets — they're faint and their parent stars tend to overwhelm their radiated light. That's why such a large mirror is needed to peer at them, Kuhn said. "The biggest telescopes that we're likely to see in the next 100 years or so will not be able to directly image cities or organized structures on the planet," he said. Still, he added, local heat sources could be visible. "We do that by using the fact that the planet has to rotate, and that civilization is clustered either by the formation of continents or the use of land, which is agrarian versus organized into population centers. The assumption we make is that civilizations will cluster their heat use. It won't be uniform; they distribute it." The method does have limitations, he added. "It is possible to be confused on a planet which is perpetually cloud-covered, and we wouldn't be able to detect a signal on a planet where somehow the alien society managed to uniformly distribute itself around the planet so it isn't clustered," Kuhn said. There's no firm location yet for the telescope, but Kuhn suggested it could be built in the San Pedro Martir mountainous area of Baja California in Mexico, close to the location of one partner in the project: the National University of Mexico in Ensenada. Kuhn's team is seeking funding from private funders, and will perhaps obtain money from patents as well. The scientists submitted six patent applications relating to optical technologies associated with the telescope design. "We are not in competition with the astronomy projects," he said when asked about obtaining federal science or NASA funding for the effort. "This is entirely private funding that we have been supported by." The team, however, is open to partnerships with other institutions. One possibility could be the Search for Extraterrestrial Intelligence (SETI) Institute itself, but the organization prefers to focus on radio telescopes right now, Kuhn said. The notion was first thought up by Caisey Harlingten, an entrepreneur and amateur astronomer who sought two years ago to find a team capable of building the telescope, Kuhn said. The group includes a member with experience building Hawaii's Keck and Suburu telescopes — David Halliday, founder of Canadian-based Dynamic Structures Inc.
Other partners in the project include Germany's Kiepenheuer Institute for Solar Physics, the National University of Mexico in Ensenada, Tohoku University in Japan, the University of Hawaii Institute for Astronomy, the University of Lyon in France and Harlingten's company, Innovative Optics. An overview concept of the project was recently published in Astronomy magazine. The group is now creating a more detailed design and seeking funding. No start date is set yet for construction. Follow Elizabeth Howell @howellspace, or SPACE.com @Spacedotcom. We're also on Facebook and Google+. Original article on SPACE.com.